Clear Skies BC – Community Care Services Inc.
Clear Skies Community Care Services incorporated is a residential program that initially started in 2006 and incorporated in 2016. We are a residential care service for youth and children who require an intensive 24 hour supervised resource that provides skilled treatment and early intervention to support children/youth. Clear Skies is committed to providing high quality, client-centered Residential Child and Youth services to its clients to assist them to lead dignified and independent lives in the comfort and safety of their own homes. Their individual needs are carefully assessed, understood and met through the selective assignment of qualified, trustworthy and compassionate personnel. Clear Skies aspires to consistently be known and valued for providing the highest standard Residential Child and Youth care services; for being the provider-of-choice in the community and for being the employer-of-choice in the community. •	applying continuous quality improvement measures throughout the Agency. For any Questions or Inquiries; please use the form on the right and we will reply promptly. Clear Skies Community Care Services office’s regular hours of operation are: Monday to Friday from 9:00 a.m. to 4:00 p.m. Personnel are available 24 hours per day, 7 days a week and 52 weeks per year to provide required services to clients. Machi and her team are compassionate, caring and are skilled in providing care for children and youth that have complex needs. They do amazing work. This organization works collaboratively with all team members in providing the best care for the individuals that are in the program. The staff are kind caring individuals and the Clearskies family are an incredible support and advocate for their youth they care for. My role is a youth worker and I have had a client that was placed for a period of time in this program. This program provides a therapeutic, caring and stable environment to children and youth and this goes beyond the years of this individuals stay at the home. I have worked with various resources including this one, for several years. I am always comforted with not only the high level of services and support they offer, but the compassion for which they work with the clientele that they do. I have said in past, and continue to state with certainty, that were it not for this resource, I am not certain that my clients would be at the place they are at. The clients I have had in this resource have been difficult and challenging (understandably) but have been nurtured, provided age and stage appropriate skills and learning and empowered to be self sufficient, healthy, contributing individuals. Keeping in mind that this may look very different for each client, however this resource acknowledges this and works within the areas of opportunity for each person. I have had the pleasure of working with Machi and her team for a couple of years now. It has been a pleasure to work with staff who have the skills, understanding and expertise to work with our most complex and vulnerable children in care. My relationship with the staff is collaborative and positive. I am also impressed with the level of knowledge and advocacy they provide to the children/youth they work with. The staff truly care about the children they serve and give them a sense of family and belonging. Keep up the amazing work! I have had three clients utilize this organizations residential service. It is with no doubt in my mind that this organization is the ideal model for residential services to our vulnerable children that are in care. The staff are caring, kind and skilled. Machi and her team work with our clients so they can work towards their personal goals and the desired outcomes for our clients; from my experience this has been nothing but positive. I would love to work with this company again and would like all of my clients to be served by this organization. Good job you guys and thank you for your commitment, care and dedication to our children and youth. I am a teacher's aid of one of the children that the Skopelitis family cares for. It's been a breath of fresh air working with this crew of individuals. The team of staff are incredible and work together in meeting the needs of a very challenging child. It's incredible how this team are able to think outside of the box and creatively in order to have the child engage. It's evident that the staff are very skilled and are very well versed in working with children that have been exposed to trauma. It is a pleasure working along side this team. You do an amazing job with the client that I have seen you "work" with. I put "work" in quotations because for me the greatest value to the services you provide, is that it is clear how much you care for these children. It doesn't seem to be able about "doing your job" but about creating a home and relationship with these children where true healing can happen through the attachment and relationships that are developed with them through your empathy, caring, consistency, and treating of them as individuals who require unique approaches. It has been a true pleasure to work with you. Your staff has always been open to teamwork, collaboration and feedback so that these children have a true wraparound service. 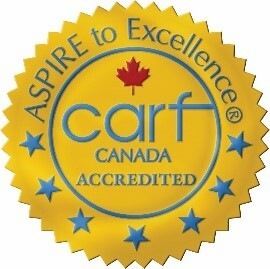 Clear Skies Community Care Services Inc has obtained it's 3-year accreditation from CARF (Commission on Accreditation of Rehabilitation Facilities) in child and youth care services for the group home care program. Click on the link below to submit a community stakeholder survey, the Login ID is 10060760 and the password is zoe! (case-sensitive) Your feedback and comments would be greatly appreciated. Clear Skies Community Care Services is looking for residential support workers to join our team. We are currently accepting applications for full-time and on-call staff. If you have any questions please do not hesitate to contact us via this website. All questions and feedback are welcomed. Please click below.